Me, J and D had a full day for a decent walk while L was at Bristol Zoo with her Brownie pack. We had intended to take D up Pen-y-Fan now he was a fully-fledged mountain man but the forecast was uncertain and looked less than promising at 8:30am. 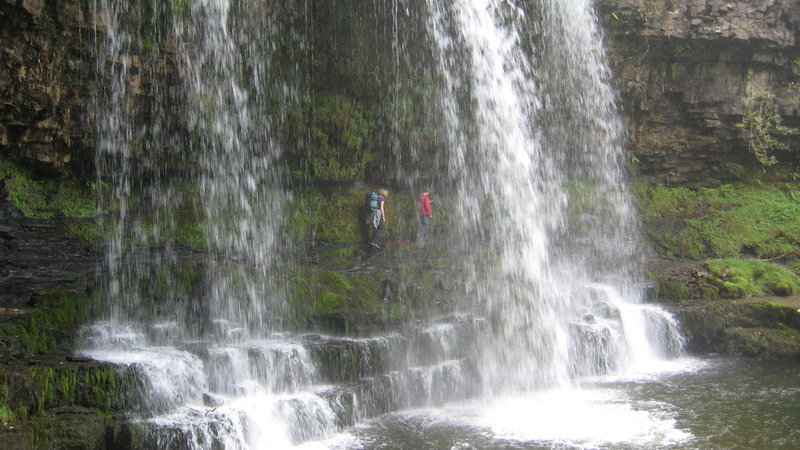 A change of plan was called for, so we set off for the Waterfalls Walk in the southern Brecon Beacons. 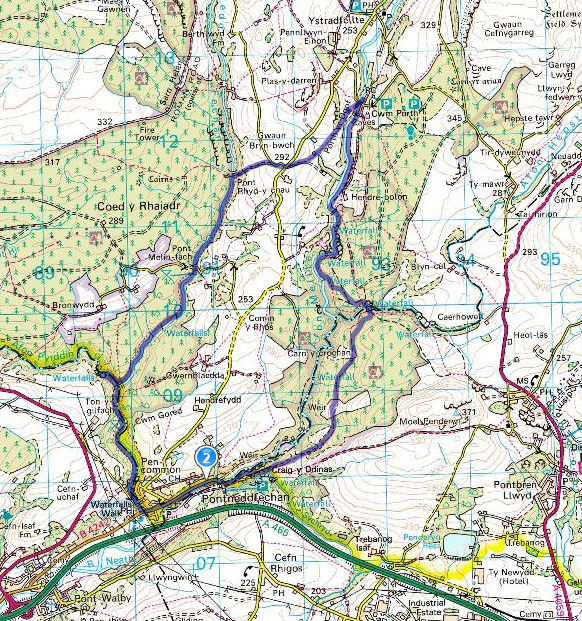 I’d done this walk with J a few years ago and it’s an ideal choice when poor weather rules out a day on the high fells. D seemed to like the idea of a long walk peppered with waterfalls and not too disappointed to miss out on South Wales highest mountain. 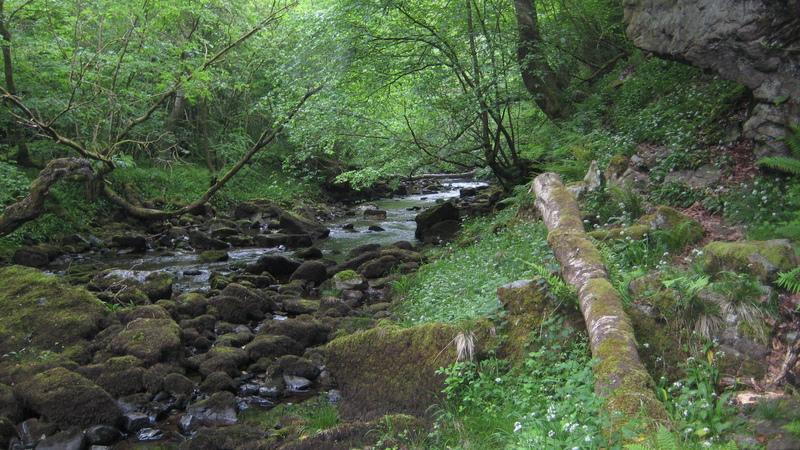 The walk starts from the car park at Ystradfellte, where the river Mellte vanishes underground leaving a series of caves behind. 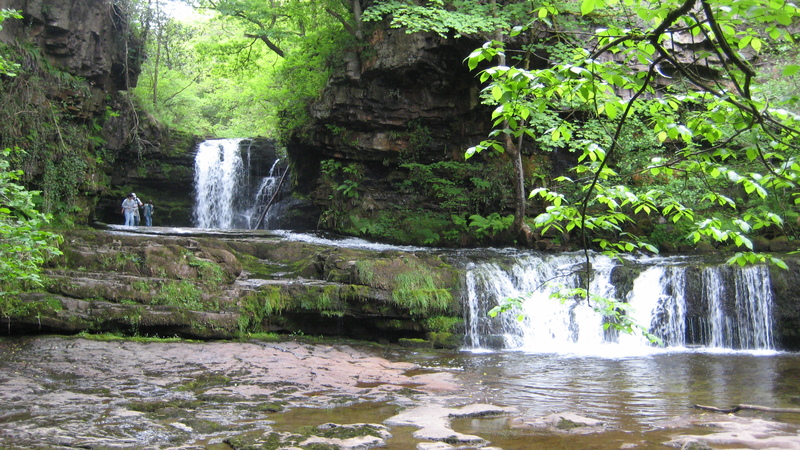 The sandstone that dominates most of the national park, here gives way to limestone that allows the formation of these caves and the Mellte, Hepste, Pyrddin and Neath rivers to create the greatest concentration of waterfalls in Wales. 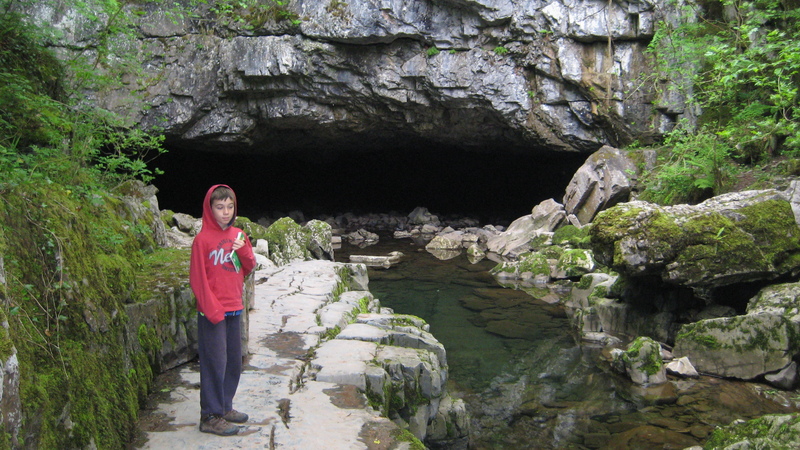 We started off around 10am by heading down to where the river should be to look at the gaping entrance to Porth-yr-Ogof. I’ve been caving here many years ago and it’s quite an easy, albeit wet scramble through the cave to the famous blue pool on the other side (home to the dangerous sport of cave diving). The walk proper starts by heading down an open path along the river after it re-appears, passing some lovely spots for picnics and rests, before arriving at the first fall, Sgwd Clun-Gwyn. 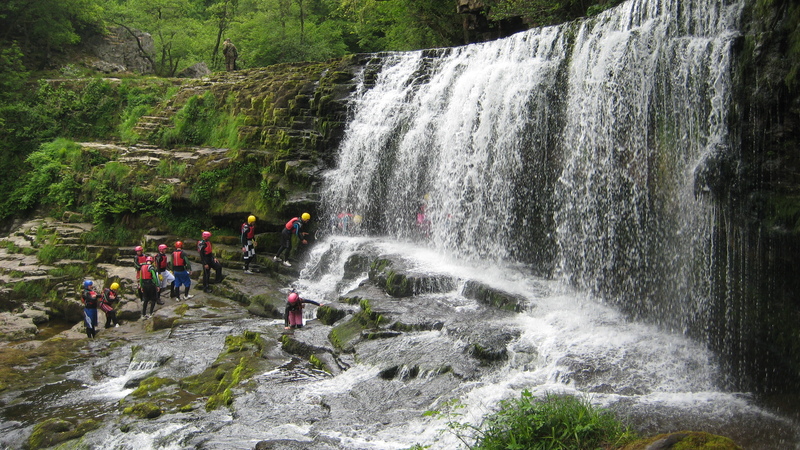 The area is a popular spot for canyoning and we could hear the shouts and screams as well as the roar of water as we approached. 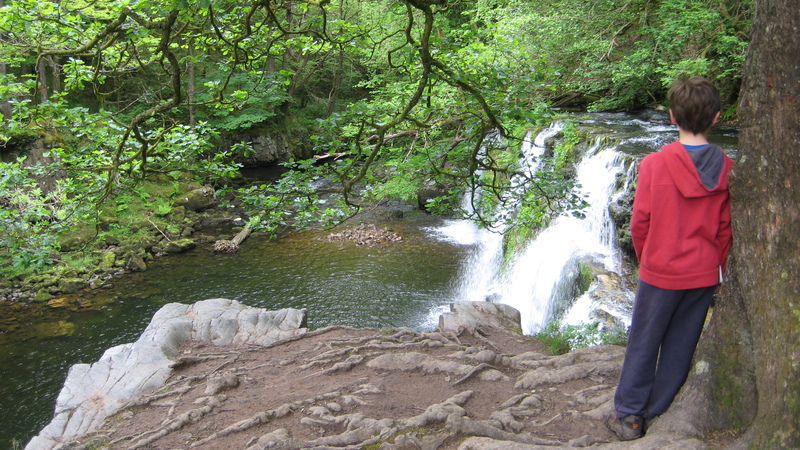 The water level was quite low but the falls were still impressive and must be thunderous when the river is in spate. 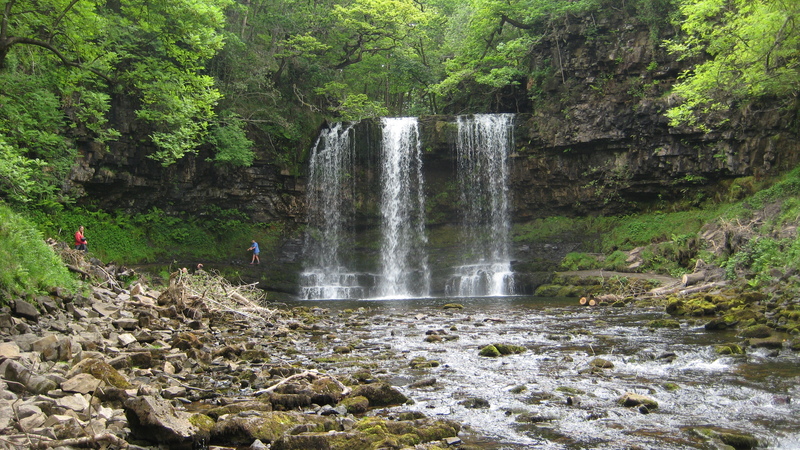 The next fall is Sgwd Isaf Clun-Gwyn where the wet-sports people can clamber behind the fall and also provide the passers-by with extra entertainment by jumping from the tops of the waterfalls into the deep green pools below. What do you mean “not this one”! 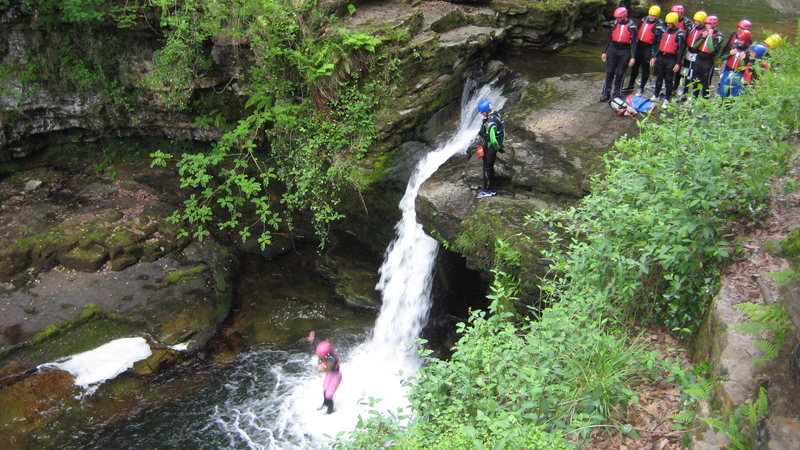 This sort of canyoning and river scrambling is one of my favourite sports but I’ve never done it here. Me and GM have long-standing plans to explore the river properly i.e. in wetsuits, one of these days. We passed the next fall Sgwd y Pannwr, which with a leap of imagination sort of resembles the Iagwazu falls in South America! The walk then continues away from the Mellte and over into the valley of the Hepste river for one of the highlights of the walk, Sgwd yr Eira. It’s a beautiful curtain of water with the added feature that the path takes you BEHIND the waterfall. It looks like you’ll surely get a soaking but in fact other than the misty spray you stay dry-shod. D found this part particularly exciting and I took some video to try and best capture the experience (it’s in the YouTube compilation at the end of the post). From here it’s a seriously steep climb out of the gorge and up to the more open hillsides above. 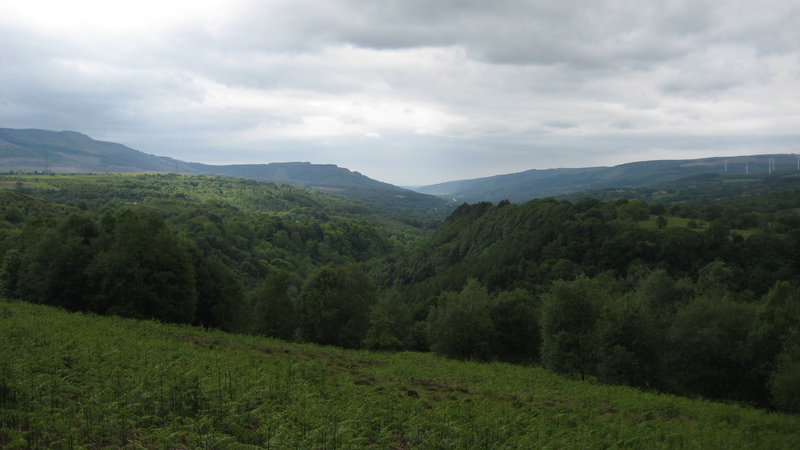 The next section is equally stunning as high level path traverses above the Mellte valley with expansive views over the Neath valley. We stopped for lunch to admire the views accompanied by some warm sunshine and some midges on a day trip from the Isle of Skye – there is probably more than enough to go round up there so they obviously felt they could spare a few. 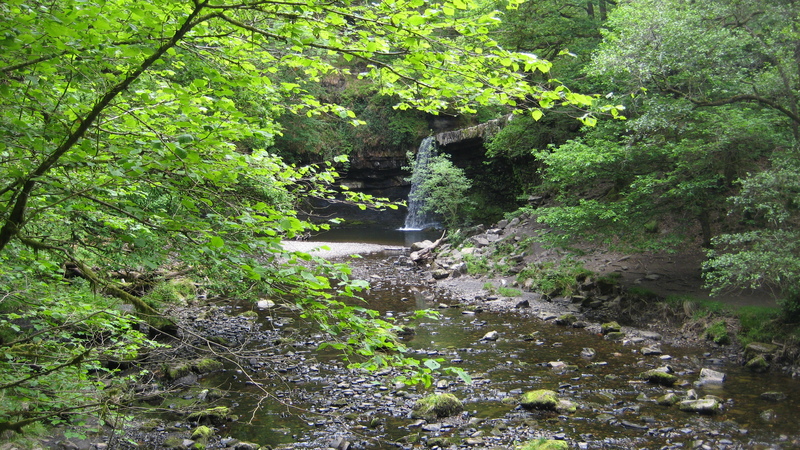 The path eventually drops down to the village of Pontneddfechan and after a drab mile along the road turns north into the next waterfall filled gorge of the Nedd Fechan (Neath). The path starts as an old disused tram-way before narrowing to a gentle path along the fast flowing river. 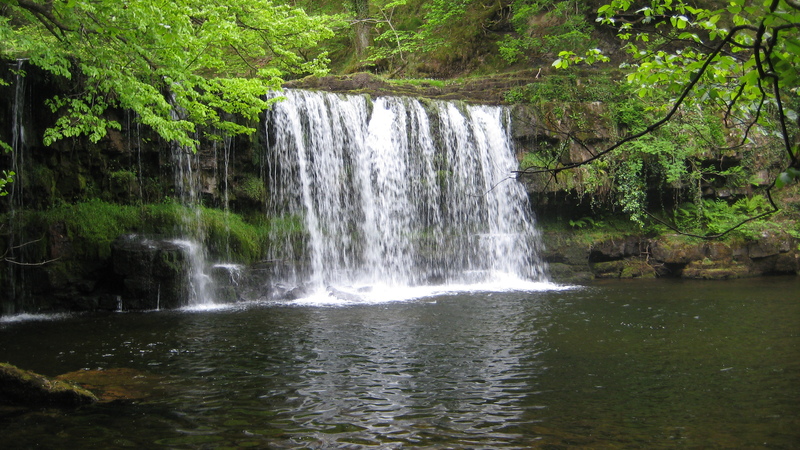 A short detour takes you to Sgwd Gwladus on the Pyrddin river. Returning to the Nedd Fechan the path becomes rockier and the river more dramatic as you pass further stunning waterfalls of Sgwd Ddwli and a final un-named one. We arrived at the lonely picnic spot at Pont Melin Fach ready for a second lunch but by now the weather had turned and it was drizzling heavily. D wasn’t too impressed by this turn of events but its all good experience and I told him some tales of far, far worse days out in the mountains. 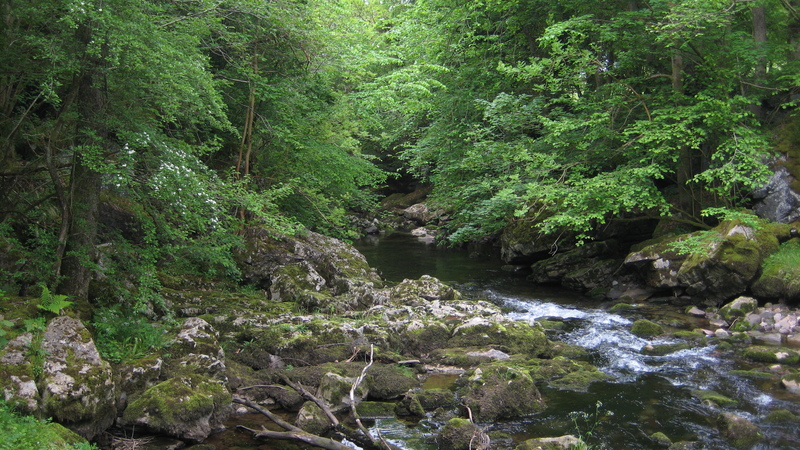 We pushed on continuing to follow the Nedd Fechan north through a much less trodden section, almost sub-tropical in its verdant lushness with new formations of limestone Tufa on the banks and everything coated in moss and dripping with water. We were all starting to feel weary as the miles mounted up and as we emerged from the trees we realised we were actually in the cloud. 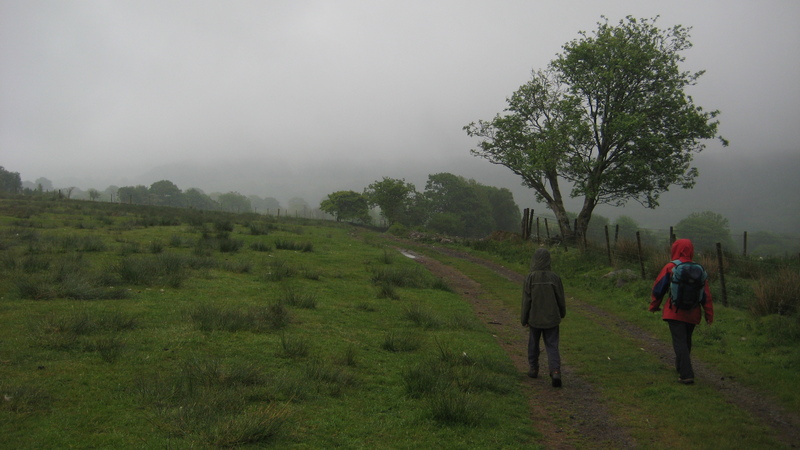 The rain eased off for the last mile over the fields to the car and we arrived at 4:30pm weary and a bit soggy. A classic walk that I can strongly recommend with something for everyone and a respectable total of 11 miles and 2,000 feet of ascent. I’ve put together a little compilation slideshow below and the full set of Flickr photos is here. Looks fabulous. We definitely have to sort out some dates for next year for a visit. Onionbag9? You mean there are 8 other Onionbags? Did this route on Monday. It was as brilliant as described. Thanks so much for sharing! 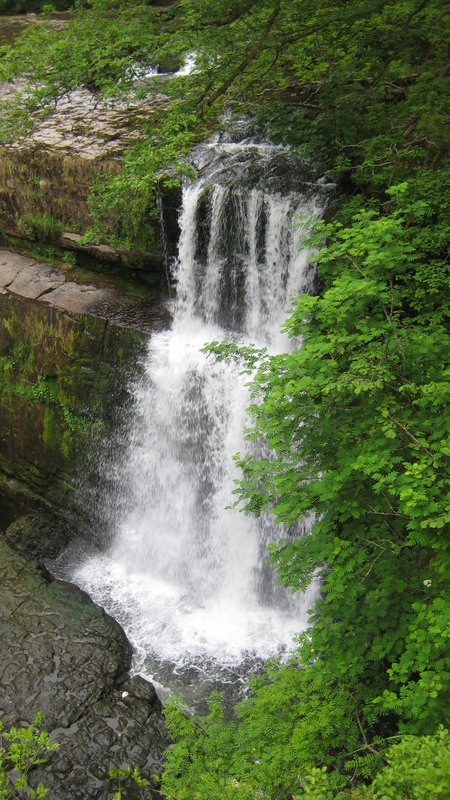 Pingback: mycountryside.org.uk » Brecon Beacons Day 3 – Waterfalls!! 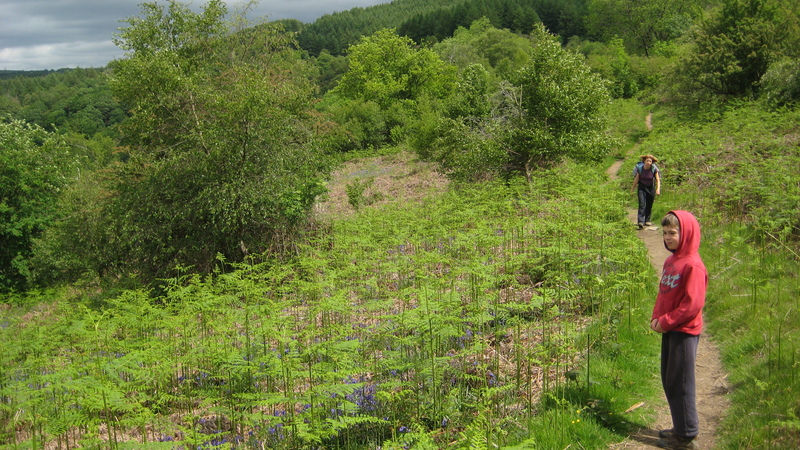 I discovered your blog through Daylight Gambler and am looking forward to doing this walk before the year is out. Thanks for sharing as it looks stunning. Thanks for dropping by and glad my blog has inspired you :). You’ll love this walk. One day I hope to have a play in the waterfalls as well to get the whole range of the experience! Great, love it! Looks like you had a bit more water than we did. These kind of walks are much better after a good downfall of rain! When I did Watersmeet in Lynton the waterfall was brilliant, although not quite as dramatic as the ones you find in Wales. There was decent flow but I’d love to go back when the rivers are in spate. Trying to get behind the waterfall in those conditions would be fun!